Hey!. You Gonna Eat or What? 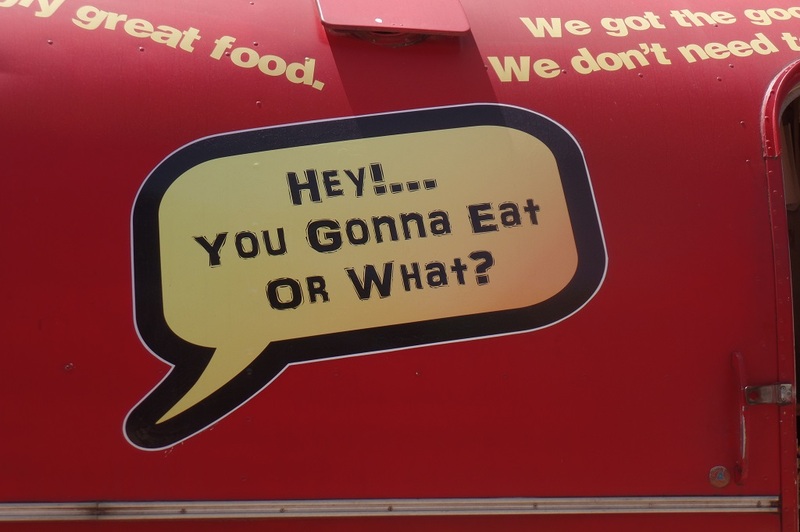 A few years ago, my husband took me to a food trailer named, Hey!… You Gonna Eat or What? Upon arriving, I decided that their line was too long, so I ordered from another trailer. My husband ordered the Shiner Monte Cristo. I remember looking at it when it came out with a light sprinkling of powdered sugar and a side of jelly asking him how he could possibly eat it. However, he convinced me to try it and I was absolutely hooked! Hey!… You Gonna Eat or What? is the delicious brain child of Eric and Lizziane Regan. This food truck is a team effort! Kyle runs the trucks window. He is always ready with a witty or sarcastic remark. Liz runs the show in the background and Chef Eric is a master within the kitchen. Chef Eric is considered part chef, part mad scientist. He does not believe in cutting corners. 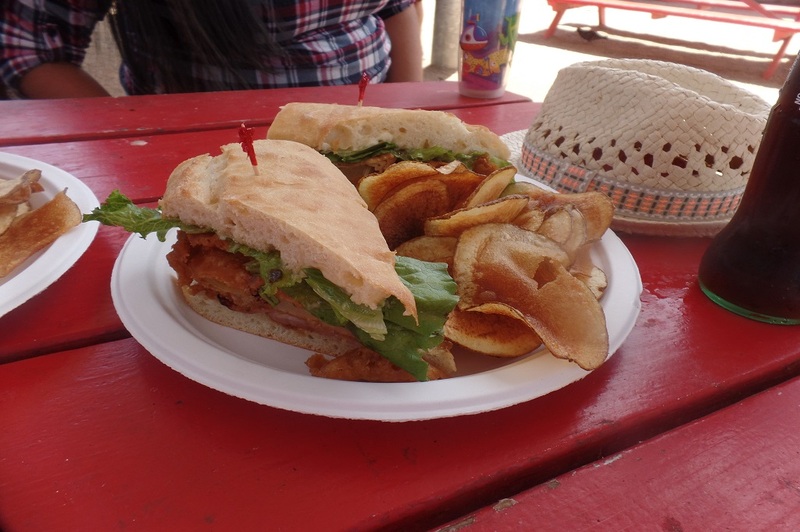 For example, they serve homemade potato chips with every gourmet sandwich. 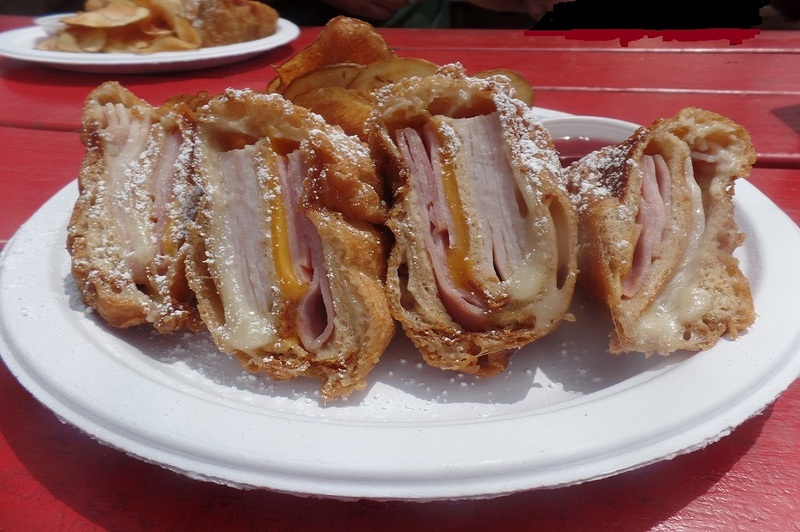 Additionally, he spent six weeks perfecting the flavors of the Shiner Monte Cristo. Liz and Chef Eric opened Hey!… You Gonna Eat or What? in October of 2011. Shortly after opening the food trailer, best known for good natured sarcasm and sandwiches, they started winning awards. 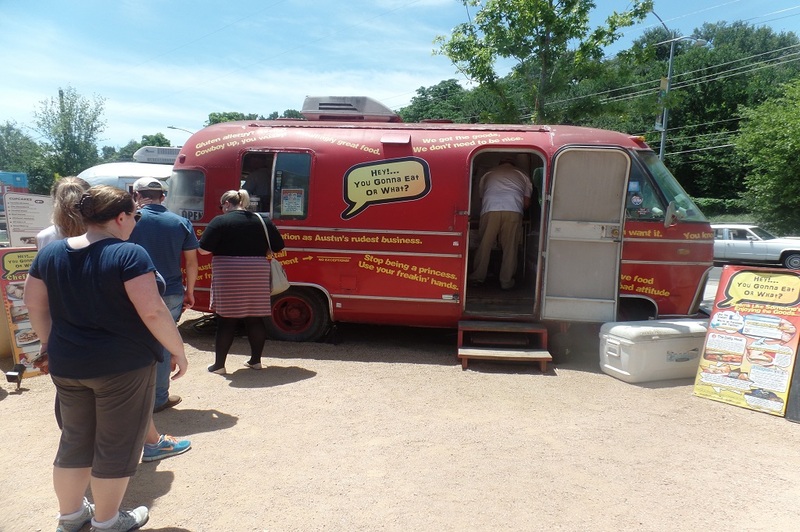 Their first award was The Daily Meals 101 Best Food Trucks in America 2013, which they also won in 2015. This was followed by Yelp’s Top 100 Places to Eat in the United States for 2015 and the Daily Meals 101 Best Restaurants in America for 2015. 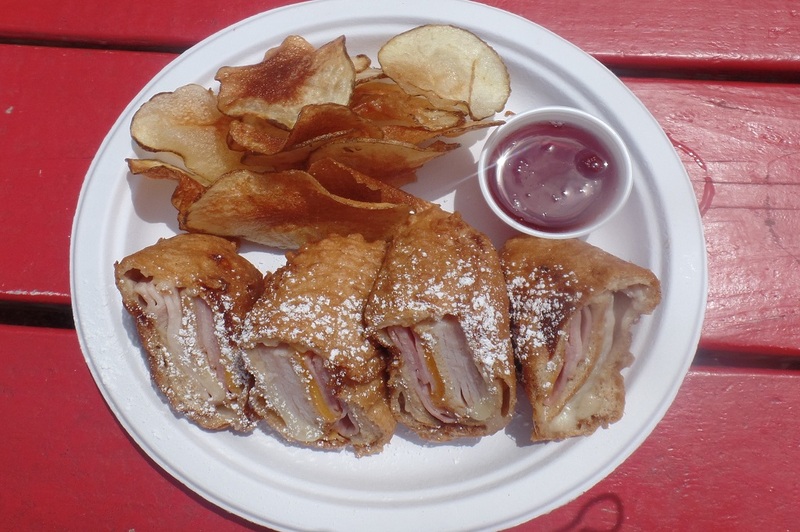 In addition, the Shiner Monte Cristo has been named the meal of choice for women in labor. And who knows food better than a pregnant woman? 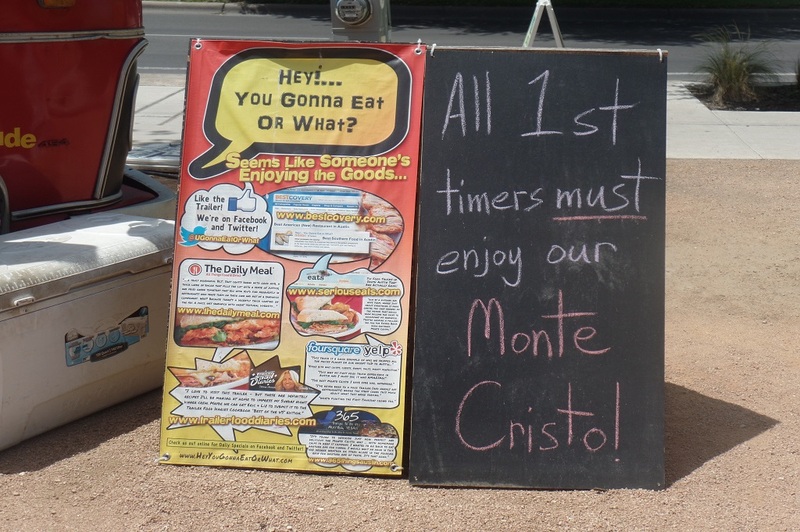 True to form, I ordered the Shiner Monte Cristo. This masterpiece consists of honey wheat bread, pit-smoked ham, mesquite smoked turkey, mild cheddar cheese, provolone cheese, and a scratch-made cherry fig jelly. 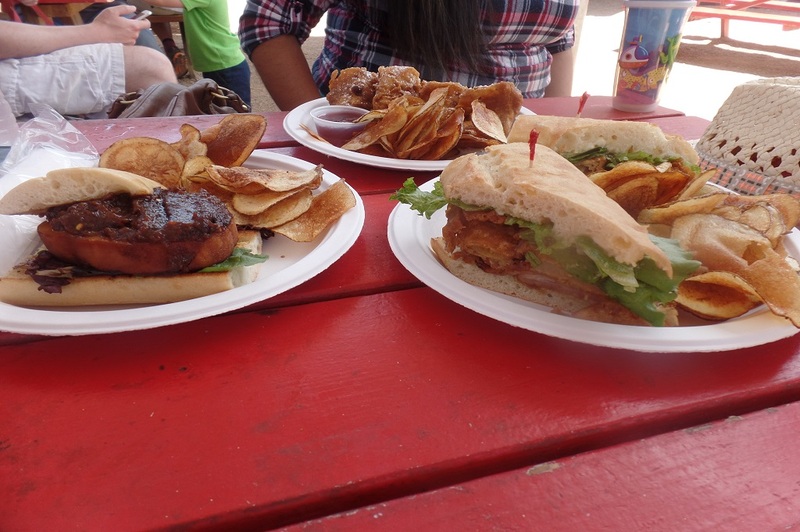 The sandwich is dipped in a Shiner Bock beer batter and fried to perfection in canola oil. Then the sandwich is cut and sprinkled lightly with powdered sugar and served with homemade cherry fig jelly. The mesquite and hickory smokiness deepens the meaty richness of the turkey and ham. Cherries, figs and honey amalgamate with the cured meats, cheeses, and beer to create a sweet and savory work of art! I didn’t want anyone to think that Hey!… You Gonna Eat or What? was a one trick pony, so I asked Chef Eric for additional recommendations. It turns out that his favorite sandwich is the Texas Mesquite Turkey. This delightful sandwich is made from mesquite smoked turkey on a ciabatta baguette with pepper jack cheese, fried green tomatoes, green leaf lettuce, and homemade jalapeno jelly. The ciabatta baguette has a mild taste with a spongy texture that is best known as a conduit for flavors. The pepper jack is spicy to taste, yet leaves a delicate and buttery taste in your mouth. This pairs well with the peppers, turkey, and the sweetness of the jelly. Could a woman ask for more? You bet! 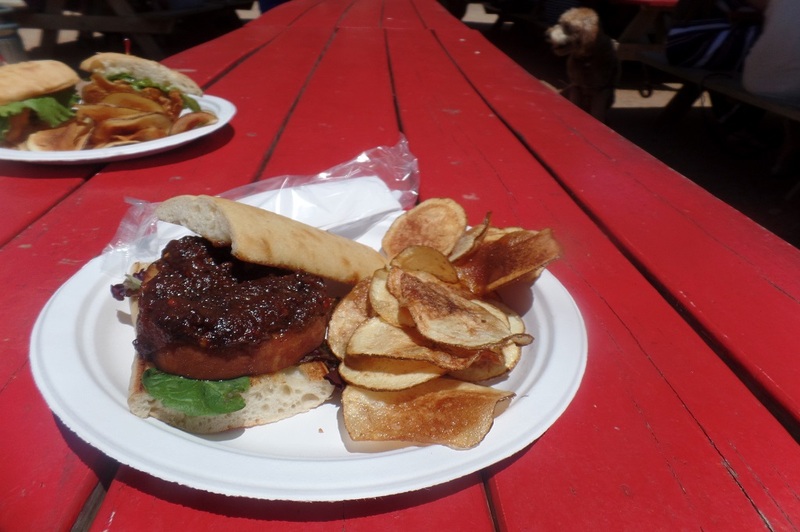 So Chef Eric sent us the Pork Chop Sandwich with Spicy Apple Chutney. This is a spectacular Special at Hey!… You Gonna Eat or What? The pork chop is cut and smoked to perfection. It is served on a ciabatta baguette with field greens and a homemade chutney made primarily from apples, raisins, peppers, and vinegar. The Pork chop, apples, greens and vinegar all have an affinity for working well together. The salty goodness of the smoked pork chop marries well with the sour notes of the vinegar, the sweet notes of the fruit, and the bitter flavor of the greens. It all combines to create a delicious explosion of flavors in your mouth. I guess it is no surprise that the Pork Chop Sandwich is now my favorite! One of the things that makes Hey! You Gonna Eat or What? stand out from the crowd is their attention to details. For example, Chef Eric comes to the table and presents each sandwich to the customer. Additionally, he brings your ice cold drink to the table along with your meal. In the end, we rolled out of the parking lot in a magnificent food coma. The kind that almost requires a nap! My family and I can’t wait to come back! Hey! You Gonna Eat or What? is located at 1720 Barton Creek Road next to Zilker Park.